BCR Fegan is an award-winning author who has written a number of fairy tales and fantasies for children and young adults. He is inspired by stories that resonate deeply with our desire for adventure, yearning for magic and search for meaning. The Grumpface by B.C.R. Fegan is a fun, rhyming children's book about a man who has been cursed to live as a Grumpface, and a young inventor, Dan, who is in love with a girl named Bella. One day, Dan goes into the Forest of Ho, looking for a rose for Bella. The forest, however, is in the domain of the Grumpface, and Dan soon gets stuck in one of the Grumpface's many traps. The Grumpface tells him that he can go free if he can complete one of three challenges. He has to either catch a glowing bird, walk across a tiny bridge, or walk through a cave full of dangers. Dan believes he has an invention for each of the challenges. Will he complete a challenge? Or will he never get to see Bella again? 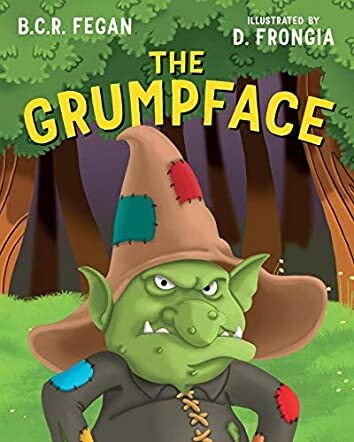 I really enjoyed reading The Grumpface by B.C.R. Fegan. The book is very well written and the rhyming is very well done. The rhyming gives the book a fun rhythm that children will enjoy. The book has many funny parts and is full of action and suspense. The characters are very likeable, especially Dan, because he's kindhearted, and very silly. The book shows that anyone can change. The pictures by D. Frongia are very well drawn and clearly depict each scene. Children will really enjoy reading this story and will want to read it again and again. The story is well developed and well thought out. I would definitely recommend this to all children.